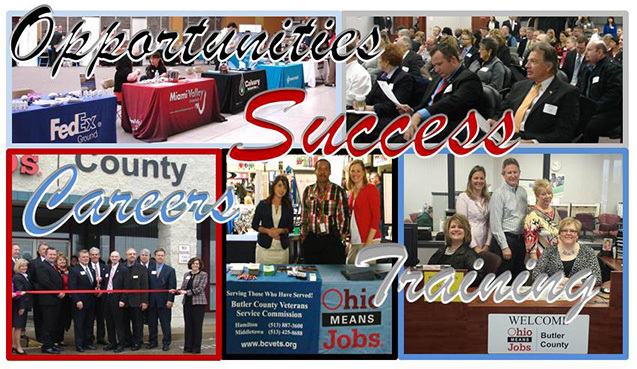 Welcome to OhioMeansJobs | Butler County! HORIZONS HRS is hiring CNC Machine & Machine Operators, Warehouse/Forklift, Assemblers, Pickers/Packers, Shipping & Receiving, Welders, Plumbers/Pipefitters, Quality Control, General Laborers, Call Center Representatives, and Administrative Assistants. Please join them to apply during their Hiring Events on Monday, March 25th from 11 AM – 1 PM, Monday, April 1st from 11 AM – 1 PM, and again on Monday, April 8th from 11 AM - 1 PM here at OhioMeansJobs | Butler County. AMAZON is hiring part time Warehouse Associates (Fairfield only) with flexible shifts and full time (Hebron, KY.) Warehouse Associates with pay up to $15/hr. plus full benefits. Join them to apply during their Hiring Events on Monday, April 1st, Tuesday, April 2nd, Thursday, April 4th,and Friday, April 5th from 9:00 AM – 2:30 PM at OhioMeansJobs | Butler County! BCFORWARD is immediately hiring several Warehouse and Production workers with pay ranging up to $11.65/hr. Apply during their Hiring Events here at OhioMeansJobs | Butler County on Wednesday, April 3rd Wednesday, April 10th , Wednesday, April 17th, and again on Wednesday, April 24th from 1 PM - 3 PM! CHILDCARE CAREERS is currently hiring Preschool Teachers Assistants, Teachers, Lead Teachers and Master Teachers! Please join them for their Hiring Events on Thursday, April 4th from 10:00 AM – 2:30 PM, Tuesday, April 16th from 11 AM – 3 PM, and again on Wednesday, April 24th from 1:00 PM – 3:30 PM here at OhioMeansJobs | Butler County! AMAZON is hiring part time Warehouse Associates (Fairfield only) with flexible shifts and full time (Hebron, KY.) Warehouse Associates with pay up to $15/hr. plus full benefits. Join them to apply during their Hiring Event on Monday, April 8th, Tuesday, April 9th, Thursday, April 11th, and Friday, April 12th from 9:00 AM – 2:30 PM at OhioMeansJobs | Butler County! TATA CONSULTANCY SERVICES is hiring Customer Service Representatives. Please join them to apply during their Hiring Event Wednesday, April 10th from 11 AM – 1 PM here at OhioMeansJobs | Butler County! TRI-COUNTY CARE CENTER is hiring Cooks, Cook Assistants, LPN’s, STNA’s, Kitchen Aide/Server, and Registered Nurses! Apply during their Hiring Event here at OhioMeansJobs | Butler County on Thursday, April 11th from 1 PM- 3 PM! TALBERT HOUSE is hiring Case Managers, Food Service Specialists – Cook, and Resident Advisors for both their Hamilton and Lebanon locations. Apply during their Hiring Event here at OhioMeansJobs | Butler County on Thursday, April 11th from 11 AM- 2 PM! HORIZONS HRS is hiring CNC Machine & Machine Operators, Warehouse/Forklift, Assemblers, Pickers/Packers, Shipping & Receiving, Welders, Plumbers/Pipefitters, Quality Control, General Laborers, Call Center Representatives, and Administrative Assistants. Please join them to apply during their Hiring Events on Monday, April 15th from 11 AM – 1 PM, Monday, April 22nd from 11 AM – 1 PM, and again on Monday, April 29th from 11 AM - 1 PM here at OhioMeansJobs | Butler County. HOME INSTEAD SENIOR CARE is currently hiring Caregivers! Please join them for their Hiring Events on Wednesday, April 10th from 1 PM – 3 PM and again on Wednesday, April 24th from 1 PM - 3 PM here at OhioMeansJobs | Butler County! PREMIUM PERSONNEL is currently hiring Machine Operators, Bank Tellers, Assembly Associates, Material Handlers, Forklift Operators, Shipping and Receiving Clerks, Customer Service Representatives, and more! Please join them for their Hiring Event Tuesday, April 16th from 12:00 PM – 3:00 PM here at OhioMeansJobs | Butler County! PROLINK STAFFING has several openings, for CNC Operators, Material Handlers, Wiring Technicians, MIG Welders, Material Handlers and many more. Join them to apply during their Hiring Event here at OhioMeansJobs | Butler County on Thursday, April 18th from 1:00 PM- 3:00 PM. SIGN UP FOR OUR WORKSHOPS - We offer biweekly workshops on Resume Building, Interview Preparation, Computer Basics , Basics of Microsoft Word and Microsoft Excel ! We can also assist you with using our job seekers database at OHIOMEANSJOBS.COM to find that ultimate employment opportunity. All group workshops are available by registration- call 513-785-6500 to reserve a slot! FAIRFIELD CITY SCHOOL DISTRICT has many opportunities for classified staff employment such as Bus Drivers, Clerical Staff, Custodial Staff, Educational Assistants, and Food Service Assistants. Employment Applications are available at the Fairfield Administration Building, 4641 Bach Lane, Fairfield, Ohio 45014. Please CLICK HERE for more information. Post your job opportunities for free! Find out what career fields are growing and what is a good fit for you. Need training? As a dislocated worker, you may be eligible to receive financial assistance to learn a new skill. Contact your OhioMeansJobs | Butler County career representative. Learn about our many partners and how they can help you. Browse through the state of Ohio's premier job site for employers and job seekers.